What is Parkinson Disease (PD)? The map starts with disease's definition, epidemiology, etiology, and signs and symptoms. Parkinson disease is an idiopathic, slowly progressive, degenerative disorder that is characterized by resting tremor, stiffness (rigidity), slow and decreased movement (bradykinesia), and gait and/or postural instability. The etiology of Idiopathic Parkinson Disease (IPD) is unknown, but most likely IPD is a result of interactions between ageing, genetic predisposition, and environmental factors. Speech becomes hypophonic, ... etc. Common features of atypical parkinsonism that differentiate it from PD. Forms of atypical parkinsonism and associated conditions. the substantia nigra pars compacta (SNc), causing the motor manifestations of PD. 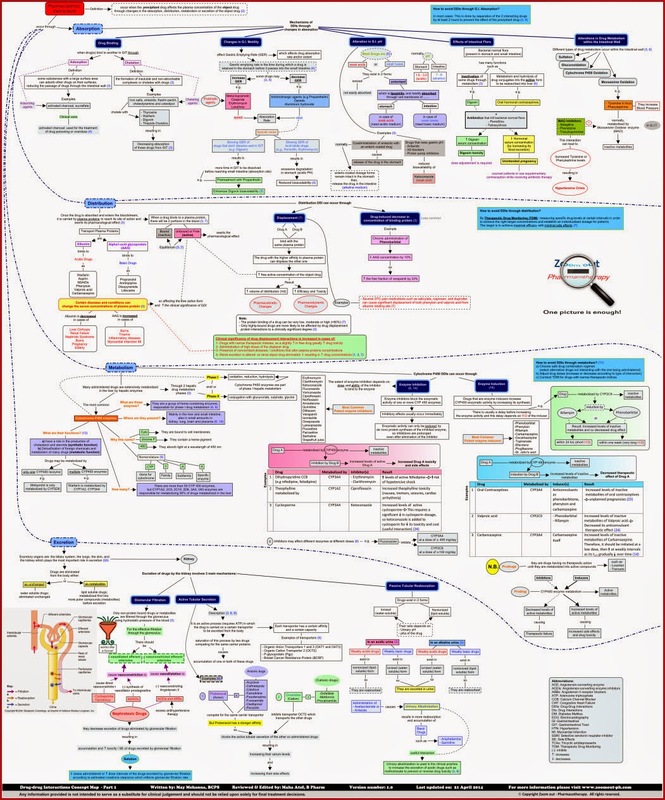 This point leads you to understand first the role of dopamine and dopamine metabolism in disease's pathophysiology and treatment. For each drug or drug class, its mechanism of action, efficacy against PD symptoms, adverse effects, precautions or drug interactions if present are explained. It is important to state that treatment of PD doesn't prevent progression of the disease and drug choice is based on symptoms. For example, Levodopa is most effective at relieving bradykinesia and rigidity, although it often substantially reduces tremor. On the other hand, anticholinergic medications are effective against IPD tremor in about 50% of patients; not bradykinesia or rigidity. Catechol-O-methyl transferase inhibitors (COMT inhibitors): Tolcapone and Entacapone. Nonergot dopamine agonists: Apomorphine, Pramipexole, Ropinirole, and Rotigotine transdermal. These complications are represented in the map through a table that contains clinical features, mechanism, and management approach for each of l-dopa motor complications. Surgery should be considered as an adjunct to pharmacotherapy in case that PD symptoms not adequately controlled with optimized medical therapy. The map briefly states surgical procedures for the treatment of PD, including the most common procedure which is Deep brain stimulation (Thalamic Stimulation) and its patient selection criteria. in order to improve quality of life. 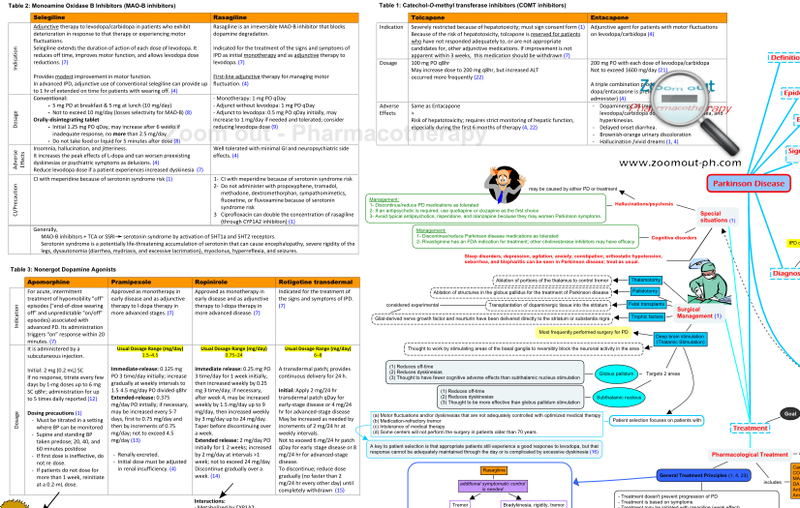 This part of the map gives and overview about medications that can be used in the management of nonmotor complications and those that should be avoided in order not to worsen Parkinson symptoms. 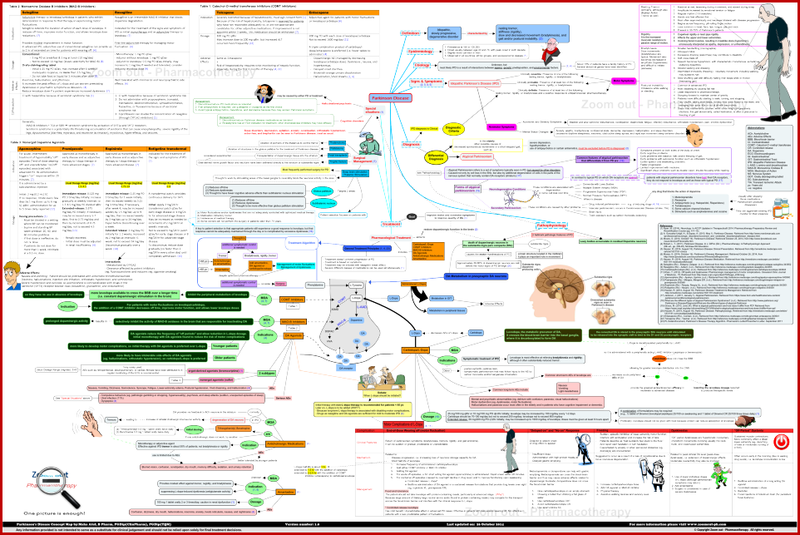 Parkinson Disease (PD) Concept Map by Maha Atef, B Pharm, PGDip (ClinPharm), PGDip (TQM).